Good afternoon all! 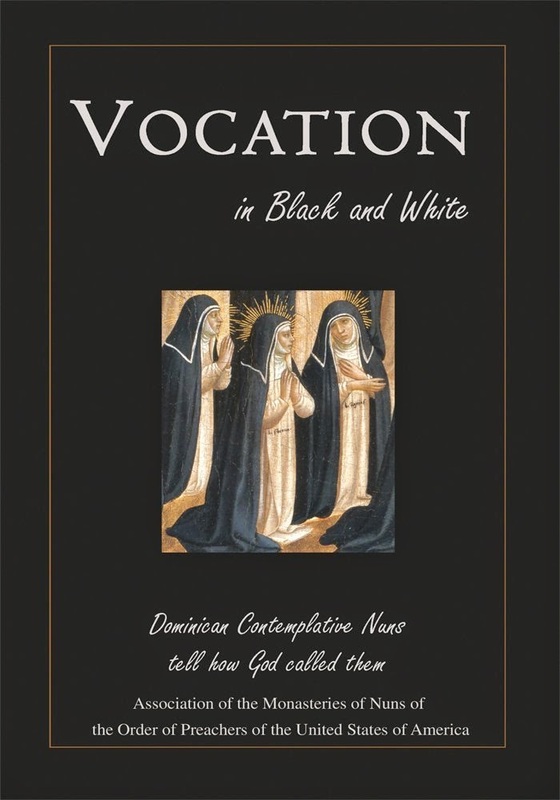 Today I am happy to be reviewing Vocation in Black and White: Dominican Contemplative Nuns Tell How God Called Them for our May Catholic Book Club selection. I have a huge soft spot for vocations stories, having contemplated a calling to the religious life myself, and I love reading books in this genre. In March, I reviewed Dedicated to God: An Oral History of Cloistered Nuns for this same reason. I absolutely love reading about people who chose a religious vocation, men and women alike. But I do particularly enjoy reading about women called to a cloistered vocation. I can't completely explain why, because even when I considered the religious life I didn't feel 100% pulled in that direction. I did consider it, but I also considered an active vocation. There is something though, about cloistered nuns that compels all of us, no? It's such a drastic thing, to remove oneself from the world, that we all want to know what drew them to this decision. Fascinating material, to be sure. And so, going into Vocation in Black and White, I brought my own excitement and fervor for the religious life. I am a person drawn to silence, and a group of women living in prayer, work, and silence is something pleasant to contemplate. And I love personal stories. You all know my penchant for spiritual memoirs. Thus, I started this book very enthusiastic. The book did not, however, grab me quite the way that I had hoped. What we get here are very brief overviews of the foundation of their calling, a nutshell version really. There were a few that started out a bit more detailed and I got all excited. Then WHAM! It ended. :) The author would wrap up unnaturally quickly. It had to be the editing process, I suspect. I didn't really like that, but truly, this is a case of unrealistic expectations on my part. This is a short book, and priced at $3.99 for Kindle download. It gives exactly as advertised: short personal stories written by contemplative Dominican nuns about their calling. I prefer longer, more detailed accounts, and that is simply not what this book aimed to do. So I would say this: if you enjoy vocations stories, and don't mind shorter ones, you will like this book, and the price is certainly right. I had a lovely glow about me after I finished reading the book, it is always meaningful to read such things. If you are looking for longer, more detailed stories about religious life, you will want to look elsewhere. Next month, my friends, we are in for a treat, I suspect. Jennifer Fulwiler's Something Other Than God is our June selection, and I am poised to savor. I haven't started the book yet, but I *adore* Jennifer's writing on her blog, and am super excited to read this. Join in, please!